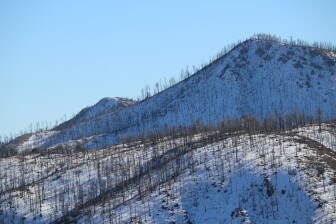 In mid-February, nearly three years after the Silver Fire raged through the Gila National Forest in southwestern New Mexico, dead trees stand like matchsticks along Emory Pass. A surge of warm temperatures hasn’t yet melted all the snow, and the charred skeletons cast long shadows down the wintry slopes. For decades, scientists have warned that increasing greenhouse gas emissions are warming the Earth’s climate. In the southwestern United States, those warmer temperatures are spurring bigger and hotter wildfires, increasing forests’ vulnerabilities to disease and insect outbreaks, and contributing to the large-scale die-off of conifer trees. Today’s wildfires aren’t only ravaging forests and threatening communities, however. They’re burning through funds the U.S. Forest Service could use to avert such disasters through prescribed burns and other preventive measures. To put the new normal in perspective, in 2014 the agency spent more than half its entire national budget fighting wildfires—up from just 13 percent in the 1990s. Drought-stressed trees are vulnerable to insect outbreaks. As the trees die, they provide fuel for wildfires. And while big fires haven’t ravaged the Sandia district of the Cibola National Forest, thousands of acres of dead conifer trees pose a hazard. Nationally, more than ten percent of the U.S. population lives within areas abutting forests and undeveloped wildlands—and developments are increasing all the time, despite the risks from wildfires. Scientists now say earlier forest mortality estimates were too low—and project that by 2100, pine-juniper forests in the southwestern U.S. will have disappeared and more than half the evergreen trees in the northern hemisphere will have died. Long before lightning ignited the dry, overgrown forest near the tiny town of Kingston in June 2013, foresters knew the area was at risk. In some ways, the Silver Fire exemplifies what happens when the legacy of 19th century management practices meets 21st century warming. You get weak, overcrowded forests that double as kindling in which fires can spread quickly. Historically, fire played an important role on the landscape. Many of New Mexico’s mountain tree species evolved with fire; ponderosa pines, for example, thrive on regular cycles of low-intensity fires. But beginning in the late 19th century and lasting into the 1970s, a national policy of fire prevention and suppression aimed to protect commercial timber stands and newly-designated “forest reserves” alike. That perspective held fire as bad and prompted foresters and others to pounce on and douse the smallest of fires. Such practices changed the character of many forests, including the Gila near Kingston, which grew dense with shrubs and small-diameter trees. In 2004, insects attacked conifers weakened by drought, killing nearly all the white firs. Meanwhile, steep terrain and a lack of roads prevented crews from clearing the dead trees. So, when lightning struck that hot, dry, and windy spring, it ignited a fire that feasted on the forest’s ample fuel. 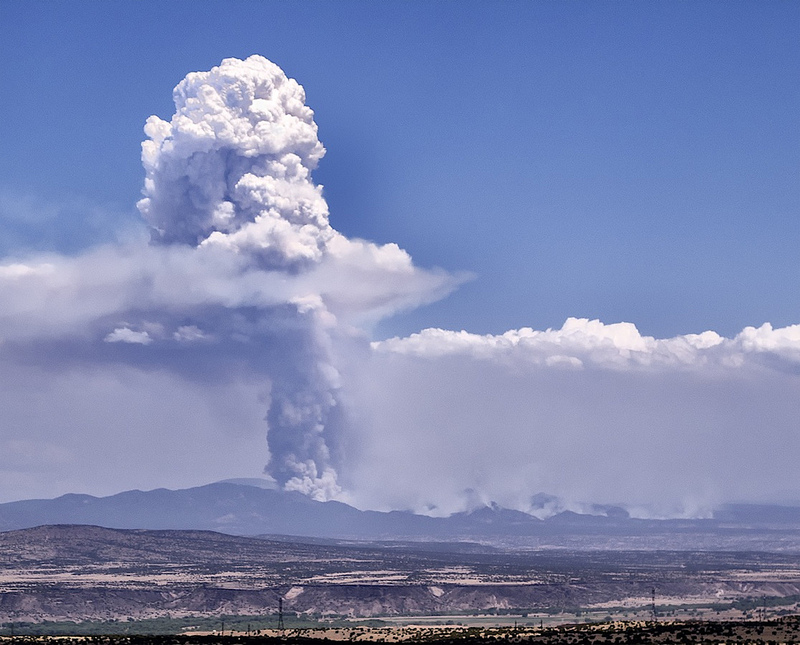 Just in the past five years, the Gila has experienced three huge fires: In 2011 the Wallow Fire, which started in Arizona, consumed more than a half-million acres. 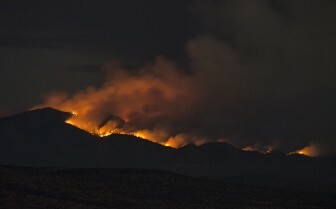 The Whitewater-Baldy Fire, the state’s largest wildfire on record, devoured almost 300,000 acres in 2012. Then the Silver Fire burned 138,000 acres. 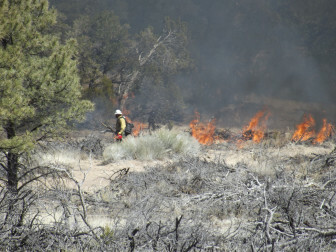 Today, in recognition of the role fire plays in keeping forests healthy, the Forest Service conducts prescribed burns in the Gila—deliberately burning off excessive fuel loads, what to hikers look like thickets and piles. Carefully planned with specific stands in mind, these are supposed to mimic historic fire patterns. Logging and thinning help, too, says Partido. In New Mexico, the U.S. Forest Service manages more than nine million acres within five different forests. The types of forests may vary, but they’re all facing challenges wrought by a warming climate. And even as managers reverse outmoded fire suppression policies, they’re grappling with shrinking budgets and lengthy environmental reviews. A few hundred miles north of the Gila, warmer temperatures and drier conditions, combined with excessive fuel loads, have dramatically increased the number of acres burned across the Santa Fe National Forest. About 2,500 acres burned during the 1980s, says Dennis Carril, the forest’s fuels specialist. Compare that with 150,000 acres between 2010 and 2014. That’s just within the footprint of the 1.6 million acres overseen by the Santa Fe National Forest, he says, and doesn’t include forests just outside their boundaries. 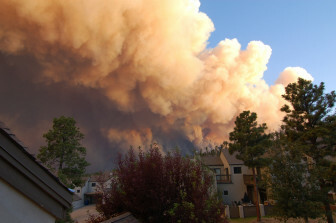 For example, one fire alone, the 2011 Los Conchas fire in the Jemez Mountains, burned a total of 156,000 acres. Only half those lands were within the boundaries of the Santa Fe National Forest. The fire also ripped through adjacent lands overseen by the National Park Service, the state, private landowners, and four pueblos. “Fire is inevitable,” says Carril, who advocates for paring back overgrown forests and reintroducing fire through prescribed burns–and continuing to reverse that old model of putting out even naturally caused fires. But, he says, fires like Los Conchas aren’t normal. That “uncharacteristic” fire destroyed the forest’s canopy and its seed sources. The impacts of those fires can last for years, even generations. Without roots in place to slow water, floods rip apart arroyos and streambeds, damaging downstream communities, degrading water quality, and destroying wildlife habitat. High-intensity fires cook the soils and drier, hotter conditions can prevent trees from returning. In New Mexico, that means brush is replacing piñon pine and juniper forests. Fighting disasters like Las Conchas is also expensive. Controlling and extinguishing that one fire cost almost $50 million; emergency rehabilitation on the burned areas cost another $2.5 million. The fire destroyed dozens of homes, and the floods that followed the fire destroyed more buildings, as well as privately-owned orchards in Dixon and the Pueblo of Santa Clara’s watershed. The total costs of the fire and its aftermath haven’t been calculated in full. But, says Carill, at $25 to $100 per acre, prescribed fires are more affordable—and yield better results. The cost of fighting wildfires is rising in part because more people live along the fringes of the forests, forcing firefighters to defend properties and communities when those bigger, more frequent fires occur due to warming. Nationally, more than 10 percent of the U.S. population lives within these zones—and developments are increasing all the time, despite the risks from wildfires. Right now, managers may have a window of opportunity. Postage stamp-sized projects—burning or thinning a few hundred acres—aren’t going to help the forest fast enough, says Carril. Rather, large-scale projects like the Southwest Jemez Mountains Collaborative Landscape Restoration are necessary. That project would burn, thin, or clear more than 100,000 acres on the Santa Fe National Forest and another 100,000 on adjacent private, tribal, and state lands. The Forest Service is also running a handful of other projects that will hit another 150,000 or so acres this year. But even modest projects require an astonishing amount of planning. Compliance with the National Environmental Policy Act, or NEPA, can take years or even decades as federal land managers weigh all of the project’s potential effects on everything from wildlife and archaeological sites to public health and the economy. After more than six years of planning, crews on the collaborative project in the Jemez will hit the ground this spring—and start to fully implement the plan. Carril views a weather pattern called the Pacific Decadal Oscillation as an opportunity. Based on temperatures in the Pacific, it can bring wetter conditions to the Southwest. Even with better snowpack in the mountains this year than in the recent past, crews need to act fast and take advantage of the conditions. That’s because the region’s warmer and drier springs have narrowed the window to burn “good” fires, says Carril—and lengthened the amount of time they spend fighting wildfires.